Learning to enjoy English outside the classroom. Getting familiar with classic novels. Having the satisfaction of enjoying and finishing a book. Getting familiar with the library. Processing and understanding large amounts of English and the resulting improvements in their own language production. A colleague on the Listening and Speaking side of the curriculum told me about using Extensive Listening (EL) with his students and the positive effects he saw from it. Off the back of these comments, and now teaching a Listening and Speaking course, I am able to try out Extensive Listening (EL) this term. There is not a lot written about EL in the Delta reading list. EL tends to have small sections dedicated to it which briefly outline what it is and how you might implement it. Not a huge amount to go on. The only online article I’ve read on it was from Schmidt (2016) in which he outlines an experiment he undertook with his students using Listening Journals. It has proved helpful when planning my own trial run. ELT Journal has a few articles on the topic of EL. Chang and Millet (2013): a key difference between L2 and L1 learners is that ‘the the foundation of oral skills has usually been established before literacy skills; however, for L2 learners, literacy and oral skills are normally introduced at the same time’ so a ‘linked skills’ approach is recommended. Their research found that students who read and listened simultaneously to graded readers and then finished the cycle by listening again without reading had significant progress in listening. To mirror the set up here: First, students listen with subtitles. Then the second listening is without subs – this could / should be explicit in the EL set up. Stephens (2010): L2 learners do not benefit from an upbringing surrounded by prosody, rhyme, rhythm, and intonation of aural texts. Students whose L1 is far from English suffer most acutely from this problem. So, learners should be exposed to the listening version of graded readers before reading them. There are echoes of this in Chang and Millet – the concept of mixing reading and listening is clearly of interest to researchers. The paper doesn’t directly relate to my EL project as I am not using graded readers and have little control over which videos the students decide to watch. However, it did make me think of the wider context of classroom instruction. Perhaps I should be telling students what is written on lesson slides (instructions, for example) before then showing the written form. This may be a beneficial teaching technique. Renandya and Farrel (2010): there is too much emphasis on teaching listening strategies, when what students really need is practice listening, and EL is the best way to achieve this. The authors suggest dictations, teacher read aloud stories, narrow listening, repeated listening, and listening while reading (again, another echo of the ideas above). Consider the use of teacher-recorded material for EL, especially with low levels. This kind of material can be graded. Encourage narrow listening for EL homework. Some students are kind of already doing this when they listen to videos from the same websites, for example many students are often visiting the movie trailer website at home. 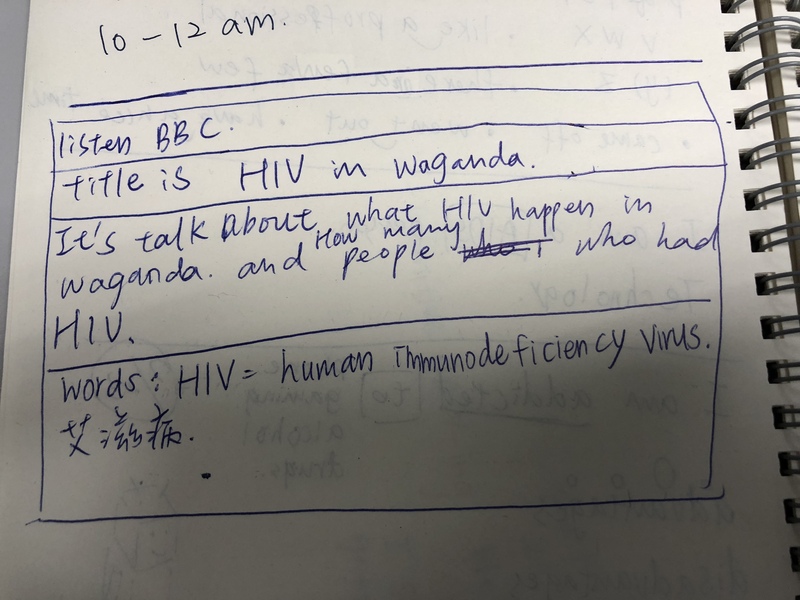 However, this could be more sophisticated but getting students to discuss and write down what themes / topics they are interested in and then searching for videos on one of these themes during the course of a week. This could very well be an interesting tweak to the way EL is run. You could ask students to watch a video that they have already watched one evening. This would allow for repeat listening. What kind of tasks could they be set for this repeat listening? Getting students to use subtitles has found some backing in these papers. Using subtitles may well be best practice not just as it helps low level students understand but because it allows them to match what they think they’ve heard (amidst the muddle of contractions, blurred word boundaries, and regional pronunciation variations) with what was actually said. Siegel (2011): EL is great as listening practice, however, students still need listening strategy training in class in order to learn HOW to listen. In response, Blyth (2012) cites an interesting educational study that suggests that actually students learn more when left to their own devices rather than under explicit instruction. Galloway and Rose (2014) set up listening journals with Japanese students, with a focus on listening to Global Englishes and ELF. They also provide a great list of websites for accessing such material. Consider having an ELF / Global Englishes component. This could be website recommendations and explicit instructions that ‘tonight you have to listen to a non-native speaker’. The My Response section could focus on the learners thoughts about accent, ease or difficulty in understanding, pronunciation or language differences they noticed compared to their teacher or American English. I was on holiday for the first two weeks of the new term, so I set up EL with both my Pre Intermediate Listening and Speaking classes (16 students in each class) on the Friday of week 2 of the course. The set up consisted of a Google Slides presentation outlining for students what EL is, its benefits, how to do it, and my expectations. I want my students to listen to / watch one audio / video every night (using subtitles if needed), complete an EL table (see below), and bring this table to class every day because at the start of each lesson there will be 5 minutes for group discussion in which students will share what they listened to the previous night. Difficult things about the video. Questions you have about the video. Connections to other things you have read or watched. (Below, in Day 4, there are some further thoughts on the My Response section). Apologies for not providing the Google Doc link itself, but my work Google account doesn’t let me share outside my organisation. I gave as much as time as I could at the end of class (10-15 minutes) for students to explore the links and complete their first EL table. Think carefully about which link to put first in the table of EL links. The Smithsonian website was popular in this first class, not because students knew what The Smithsonian was but simply because it was first in the table so attracted a lot of clicks. Put a website that you would highly recommend top of the list. You can’t always prepare for the videos that students might watch. The first video on the Smithsonian Channel was titled Five Young Lion Brothers Mate with One Lioness. Rather awkward to see this video loading on five different computers with the warning message, ‘This video contains scenes that some viewers may find disturbing – viewer discretion is advised’. It may be a good idea to click on and show a few of your most recommended links in class. This may help push students to visiting those links. I only thought of this after class. Roughly 60% of students had done their EL homework and completed an EL table. They discussed their EL together at the start of class. Those who had not done anything listened and looked around awkwardly. I created this after class and decided I would show it to the students the following day as an incentive for them to do their nightly EL. Homework, as it is and will be every night, is to complete one EL with a table. After a lesson warmer, students shared their homework. A few more had done it today. As they were discussing and sharing what they had listened to I put the EL record on the screen without saying what it was. It caught their attention when they saw their names on it. Concerned glances shot around the room. After being asked what it was, I explained this was my record of their EL work. If they had listened to something and completed an EL table, then they would get a ‘1’ in the record; if not, they would get ‘0’. Awareness that their EL is being monitored has had a huge effect on participation. Day 4 and 5 had 100% of present students (there were a few absentees in one class) coming to class with a complete EL table. Nice. Despite making it very clear (or at least it seemed clear to me) that their EL homework included this slightly different element, hardly anyone had actually found an example of consonant – vowel linking in the EL sharing session at the start of the following lesson. Now, this may be just because it was too hard to find an example. Quite possible. Or it might have been because they didn’t understand how to do it – I could / should have stepped them through how to do it in class, by drawing an EL table on the board. Sometimes I’m amazed how students need to SEE how something is done before being able to do it themselves. I set the homework right at the end of class after a rigorous pronunciation / listening lesson so perhaps they just weren’t not really paying attention enough. Whatever the reason, very few noted down an example of consonant – vowel linking. So what other options for the My Response box are there? Questions for someone in the video. Difficult things about this listening. Connections to other things you have read or watched. (Difficult to explain how to do this to students). Draw a picture that represents the video. Listening for connected speech and decoding it (Micro Listening – requires learner training). It is quite possible that explicit in-class Learner Training needs to happen for high quality and varied My Response options. Again, students get things best when they’ve seen examples of what they are supposed to do, especially at relatively low levels such as this. Perhaps in class next week I will provide more examples of how to do the My Response section. Most (~90%) students are now coming to class with their completed EL table from the previous night, ready to share what they listened to. While some students are consistently doing a great job with their EL record, others are doing the bare minimum of work. It’s a little hard to know exactly what kind of information everyone is recording in their EL table as all I am doing to check is monitor the room during the EL sharing sessions to take a quick peek of each students’ EL table. That said, there is still a majority of students completing their EL tables to what looks like a decent standard (judged purely in terms of how much content they have produced in their table). Pleasingly, some students have continued to record examples of consonant-vowel linking. Lin has photocopied a bunch of table templates and fills one in each evening. Very organised and perhaps a good recommendation for other students. Hang is not using any EL table template. It seems like she is just writing a paragraph for each thing that she listens to. I am not going to tell her to stop as she is usually producing more content than anyone else. 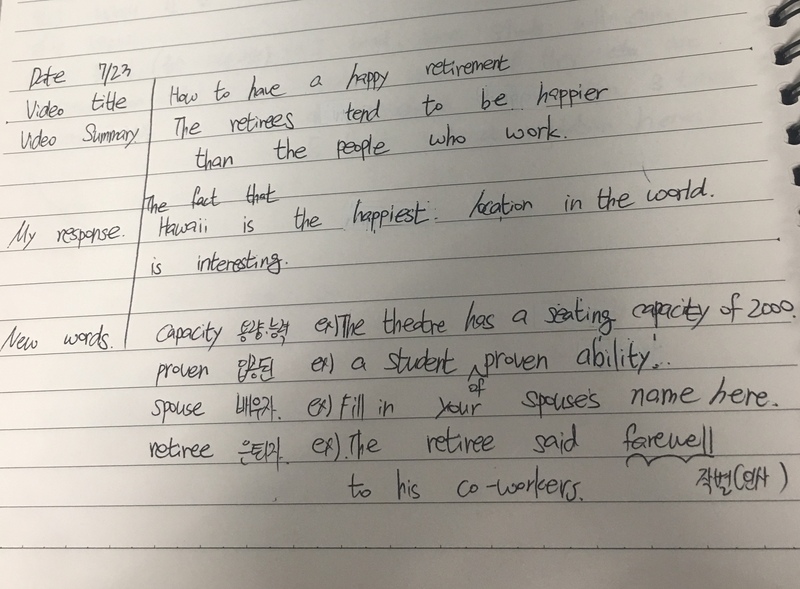 Some students are producing vocabulary sections with a few details (translation, English meaning, pronunciation information). 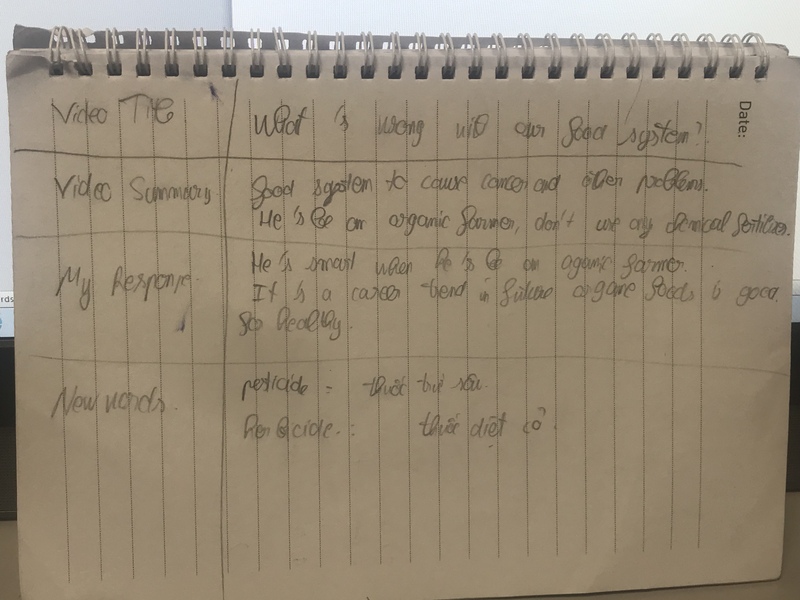 Some students are putting a minimal amount of effort into the completion of their EL tables – one short sentence in the My Response section and the same in the summary. Often these My Response sentences amount to little more than, ‘I like this video because it’s interesting’. Most students are not making use of the vocabulary section. They are just writing one or two English words that they didn’t know from the video… and nothing more. No meaning, translation, sentence, or any other word information. Students need learner training in how to record vocabulary at low levels. They do have some experience of recording vocabulary from another assignment in which it is a task component. However, they clearly need a reminder and guidance. The teacher should mark / formally check EL tables occasionally. 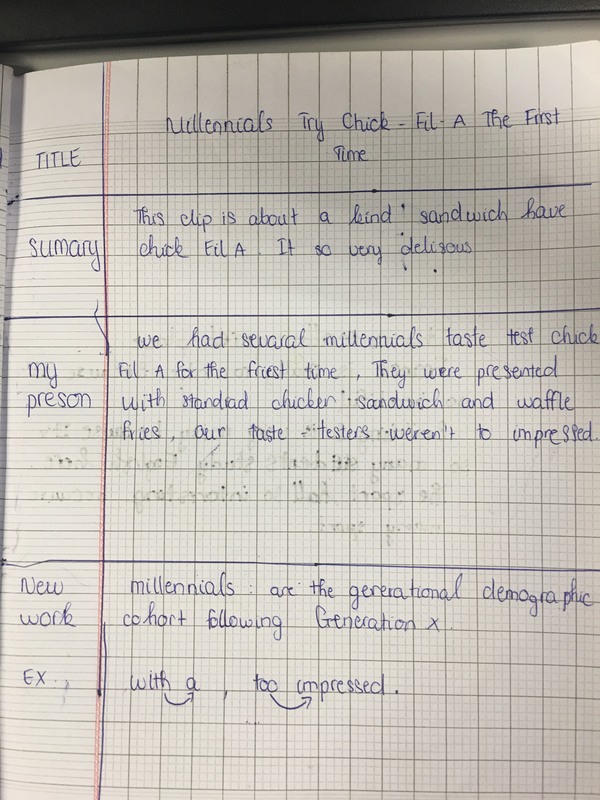 This could be by getting students to hand in their notebooks at the start of class and then the teacher quickly reading them at break time, or perhaps students could take a photo of their night’s work and upload to a G.Drive folder / email the teacher. This may just help to increase the quality of some of the EL tables. I am however a little wary of putting too much emphasis on quality of output here as the whole point is to increase the amount and regularity of listening that students do outside of class. A follow up computer lab session may be a good idea. In there we could review the rationale for EL and the requirements / options of the EL tables. We could also have recommendation time, where students recommend websites / videos to each other. This was a busy week for the students, with assessed presentations on the Thursday. For that reason we only had EL sharing sessions on 4 days this week. I ran an Extensive Listening Follow Up session in the computer lab for the final 30 minutes of Friday’s lesson. Annoyingly, many students were absent from one of the classes, presumable recovering from / rewarding themselves for the stress of Thursday’s presentations. which websites students have used most. which ones they recommend to other students. in general, what content they have been writing in the My Response section in their EL tables. in general, what content they have been writing in the Vocabulary section in their EL tables. questions for somebody in the video. a picture that represents the video. 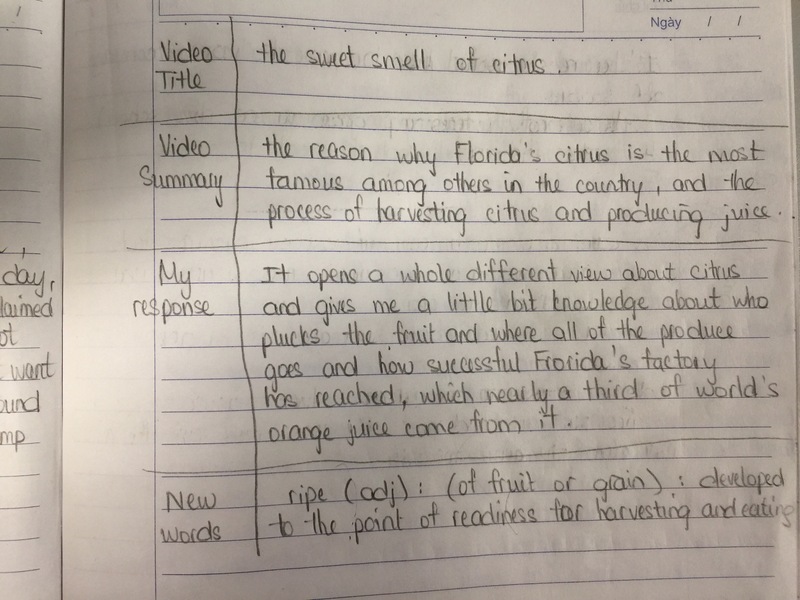 a connection to another video they have watched (I am still not convinced that students really understand this concept, and I think they would benefit from seeing examples of how to do this). reminder that simply writing a new, unknown word, in the Vocabulary section, is not helpful. 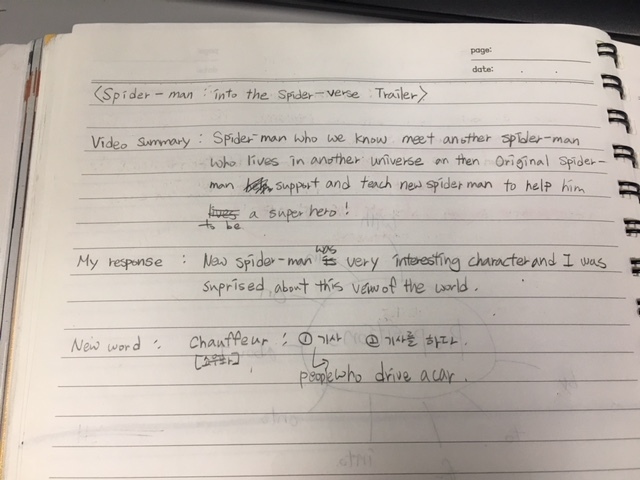 I wanted to see in detail what kind of content they were actually producing as in class all I really do is glance to check they have done the homework. I wanted get some evidence of EL for future reference and use in potential workshops about EL. Try to find 5 videos all related to this topic. Save those links. Watch those videos during one week of EL. Find a video you have already watched. Watch it again. In the My Response box, comment on how much more you understood the second time around. Try to do this with every video you watch. In the My Response box, comment on how much you understood when watching without subtitles. 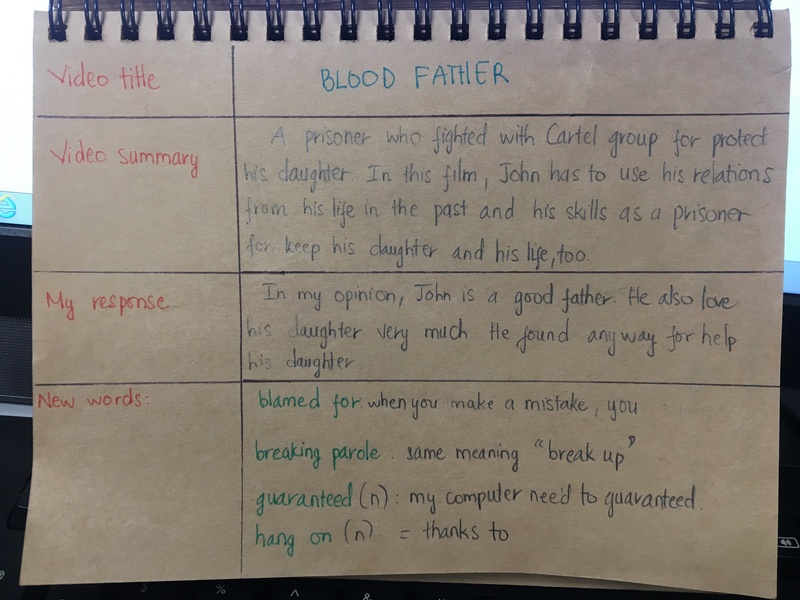 I gave everyone a handout with the bullet points for effective vocabulary recording as well as these three tips for how to do EL. 68% said they enjoy doing EL. 76% said they think EL has improved their listening skills. 48% said they can remember new vocabulary from their EL. 56% said they will continue to do EL on their own when this course finishes; 44% said they may continue to do it. TED, Listen a Minute, Everyday Conversations, and Subtitled Movie Trailers were the most liked websites for EL. 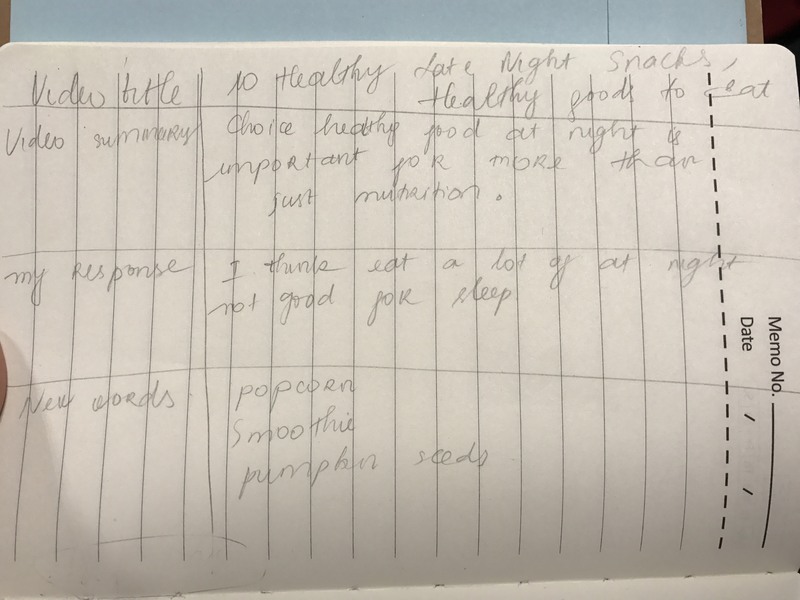 For the intermittent weeks I have just let EL run, setting it as a short homework every night and having students discuss their homework in the following lesson. Most students continued to do their EL homework most, if not every night. As we got into the final two weeks of term I eased off, setting it less and doing fewer checks. Assignments built up and I felt students had enough pressures. In the final three weeks of term I set EL less, perhaps 3 times a week, but rarely checked it in these final two weeks. I am not sure why I eased of quite so much. 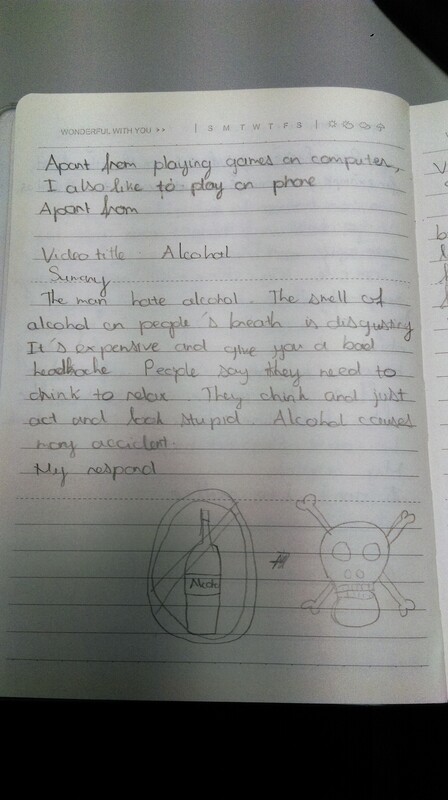 Part of it was definitely due to the fact that I could see a few students were just recycling old EL entries in class. Some students were barely even trying to hide this fact. This is a key takeaway from this project. I sat down with a teacher at work who has been running his own version of EL with an Upper Int class. He is using adapted material from Anthony Schmidt (see refs.) and is having some success with his students, though it does sound like they are not quite as keen as mine overall. We had a good chat and will follow up. 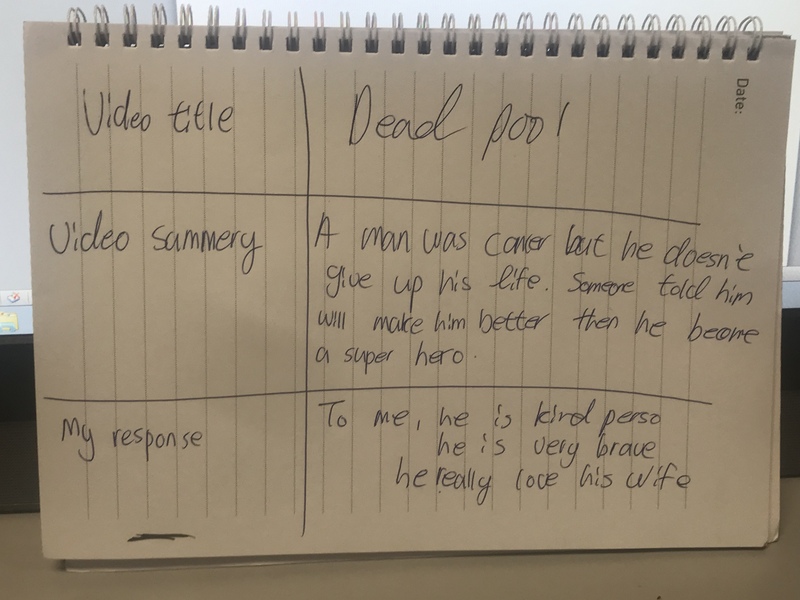 Some students wanted guidance about which videos to watch. There was too much choice and some of the videos were too hard. Some suggested the teacher set a video for the whole class to watch, and then this would allow for more interesting discussion in class. 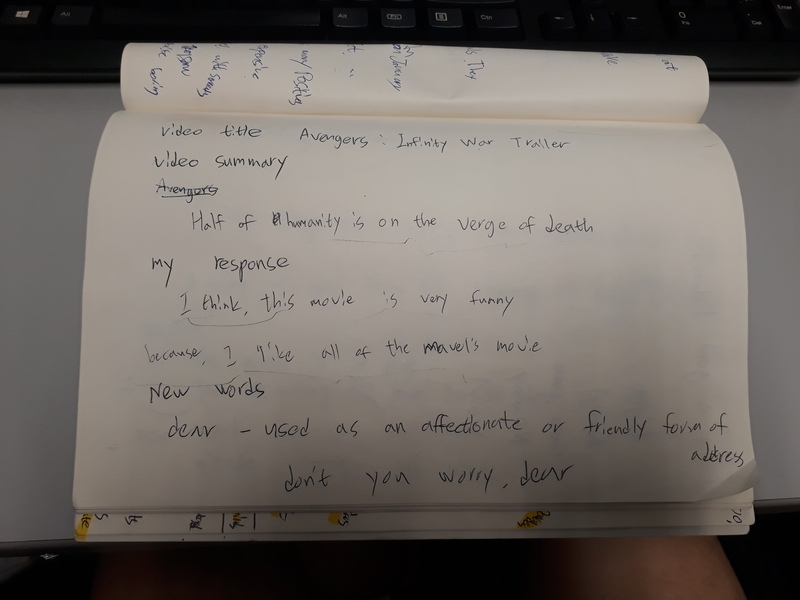 Some felt the in-class discussions were not that interesting as everyone was talking about different videos and new vocabulary so sometimes it was hard to follow what each person was talking about. Again, discussions about the same video would be better sometimes. there were largely positive comments about the process of doing EL and its effect on the students’ listening ability. In class A, students completed 257 EL entries, at an average of 16 per student, over a 7 week period (35 lesson days). In that period, there were 12 days in which I forgot or chose to not check EL. EL was set for most of those days, but for one reason or another I did not check it. In class B, students completed 233 EL entries, at an average of 14.5 per student, over a 7 week period (35 lesson days). that period, there were 16 days in which I forgot or chose to not check EL. EL was set for most of those days, but for one reason or another I did not check it. Some students will simply try to re-use old EL homework. There needs to be a way of making sure this does not happen. Spot checking, or even checking every day does not guarantee avoiding students doing this as 1) it’s hard for the teacher to check every one’s EL in detail; 2) the teacher can’t remember what ELs different students did on different days. There needs to be a system (online?) 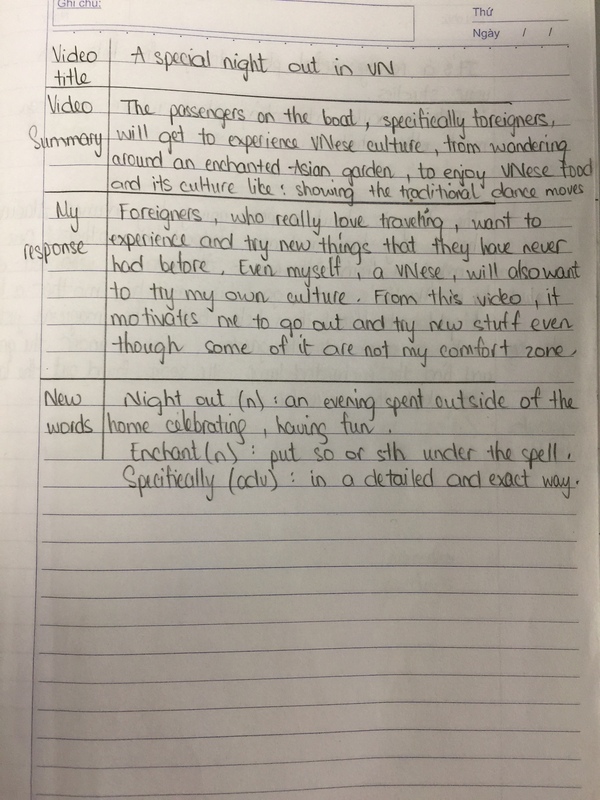 in which students input their EL work. But even this could be abused, as students could / would (?) just share EL work with each other. Perhaps the best deterrent is simple and lies with the teacher: when monitoring EL in class, as students share their previous night’s homework, the teacher can / should ask questions to random students: What did you listen to last night? What was it about? Can you show me the last few EL entries in your notebook? This may help to keep students on their toes and ensure that they are coming to class with a fresh EL entry. No matter what the intervention strategy, it seems that re-using ELs will be a problem. Despite diligently checking EL every day for the first 6 weeks of the project, rarely missing a day, in the final 3 weeks I really eased of checking. Assignment pressure (so lack of time for other homework), and pressure to allow class-time for language learning and fitting in other important material, contributed to this. However, a sense (in me) that the EL sharing sessions were getting repetitive and samey also moved me to not check it much. I also figured that IF students had picked up the habit of doing EL by themselves and were doing it regardless of whether I set it, then it wouldn’t matter if I checked in the latter part of the course. This last point is likely wishful thinking though. The teacher should provide more guidance about which videos to watch. The teacher should set specific videos to watch occasionally, and then students can share opinions about the same video. This would make for more interesting class discussions. The teacher could set a choice of 3 videos to watch, and then in class, students can gather into groups who watched the same video for discussion. So that is the end of my first EL trial. A very useful experience for me and I think for many of my students. I gathered useful information from my students and from reflecting on the experiment, as well created a set of materials that can be used with future classes. Blyth (2012), Extensive listening versus listening strategies: response to Siegel. ELTJ 66/2. Galloway and Rose (2014), Using listening journals to raise awareness of Global Englishes in ELT. ELTJ 68/4. Great stuff. I have read about benefits of ER but not EL. Thanks for sharing. I like the way you got them recording the information gradually so that it became a habit and did regular checks. As a learner I often felt less motivated to write, when the teacher didn’t check my work routinely. Regarding difficulties in getting students to identify examples of consonant vowel linking, I think that’s quite hard even for native English speakers. I guess giving them examples is the best way but there is no guarantee they would be able to do it well. Thanks for looking at this pretty long post! It was a good experiment and I did it again in the following course with the same level (Pre Int). It was another success, though one class got a lot more into it than the other. It’s an area I want to keep working on as listening is just so hard for students.